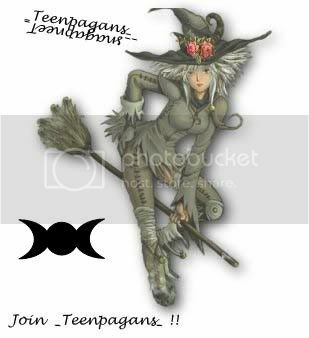 Welcome to _teenpagans_, a place for young pagans to meet other fellow teens who are intrested in paganism, and related subjects. This is a place to post your pictures, poetry, graphics, ideas, questions, suggestions, favorite pagan lyrics, upcoming events, your pagan based communities, and really anything else you would like to share! This is a very open community, so feel free to be yourselve, and not feel so restricted by pointless requirements and rules. No, you do not have to be between the ages of 13-19, you don't even have to be pagan... however, if your a teenager at "heart" or just enjoy the company of young people, you are welcome to join... And really, it would be helpful to atleast be intrested in paganism, considering this is a pagan based community. (2) NO Fluffy Bunnie-wiccans, or people who only claim to be pagan because that seems to be the "cool" thing to be nowadays. (3) Please make it a point to post the community banner in your userinfo apon joining, to support our community. (4) Put large pictures or stories, etc. behind a LJ-cut. For questions, comments, or suggestions contact one of the following.